The HMS Bounty was commissioned for a special mission of acquiring breadfruit plants for Royal Navy from Tahiti. 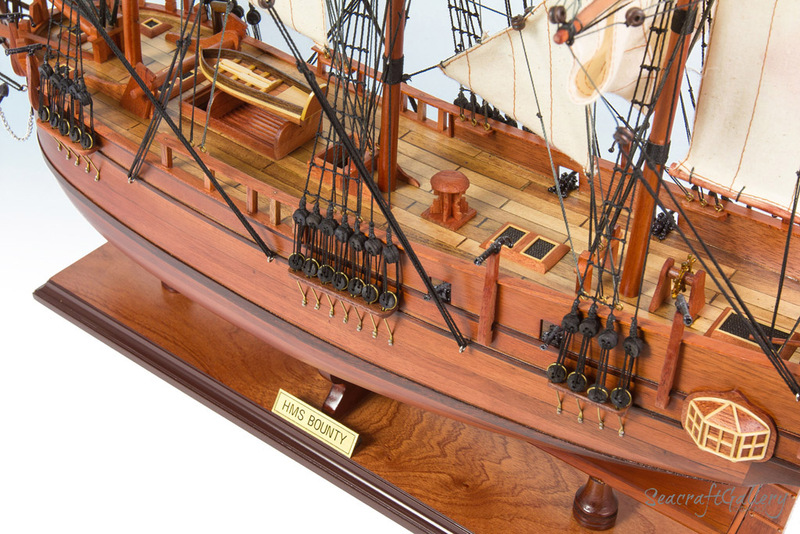 The HMS Bounty was small in size, but big on impact. 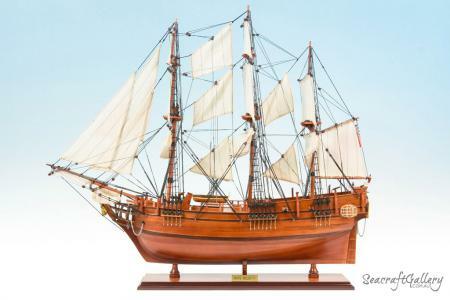 Sent under the stewardship of William Bligh, sailing halfway around the world to Tahiti and back to the coast of England, the ship never completed its original mission due to an incident mutiny commonly known as the mutiny on the Bounty. 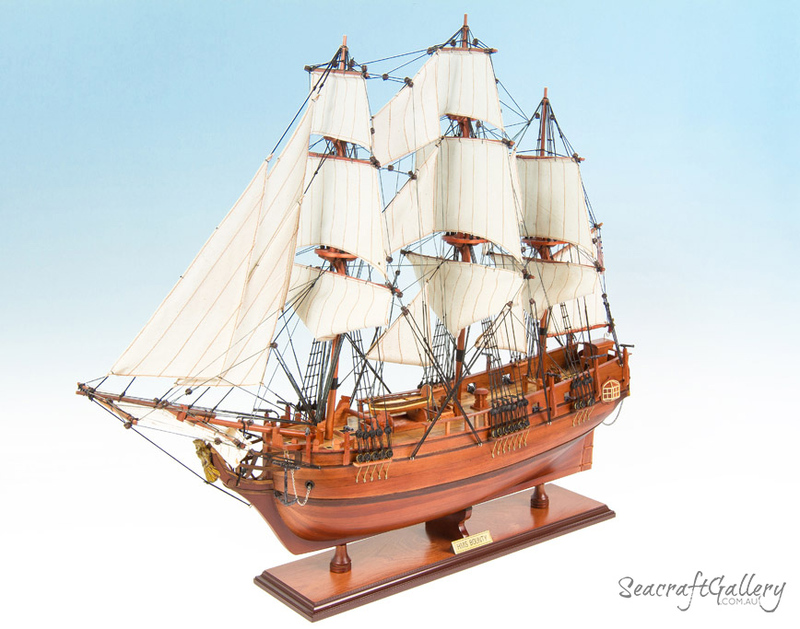 It’s a fantastic choice of decoration with 75cm HMS Bounty model ship. 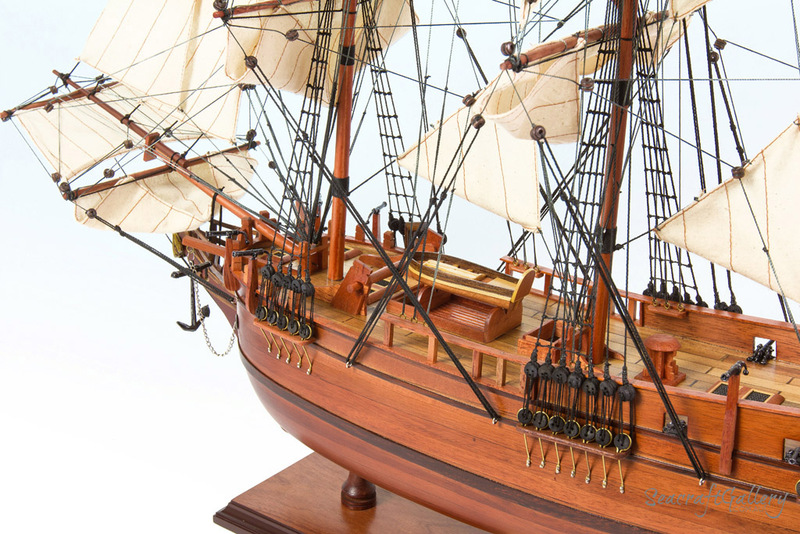 Handcrafted and designed to deliver the best possible take on the real thing, this model offers you a glimpse into the maritime trading of the past. 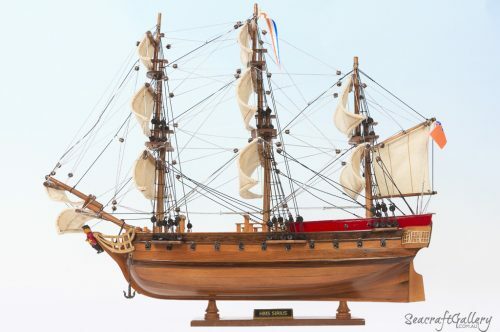 Impressed take on the ship, leaving you with an HMS Bounty model ship as close to the real thing as possible. 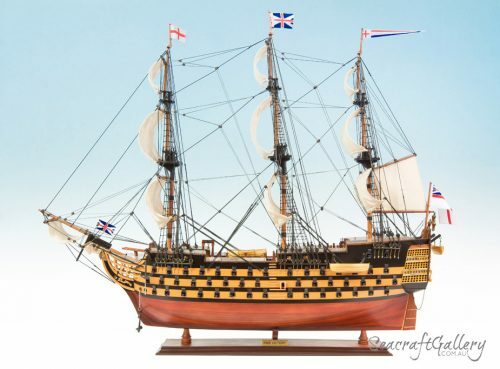 One of our most popular model ships for sale, this is a 75 x 18 x 68cm replica in 1:36 scale. 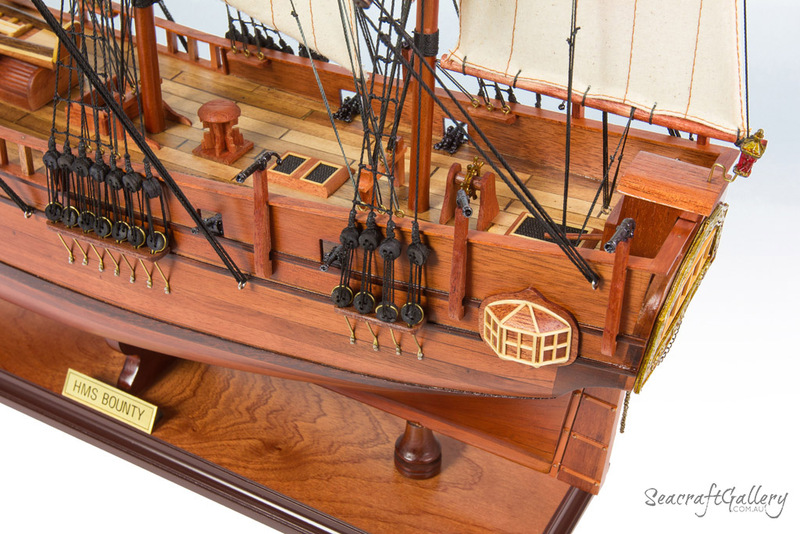 Attention to detail on the layout, scale and materials used on the ship. Made from individual wooden planks and high quality wood & metal throughout. Gun ports cut directly into the hull, not stuck on. 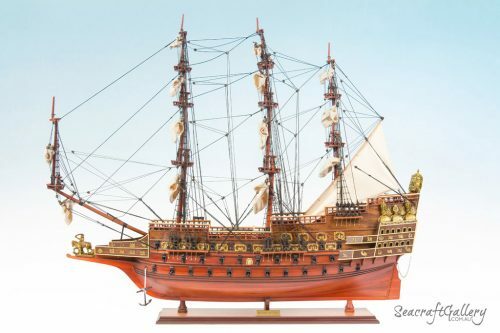 All decorative details – cannons, anchors and decorative linings are metal-sculpted for the best look. No plastic used. 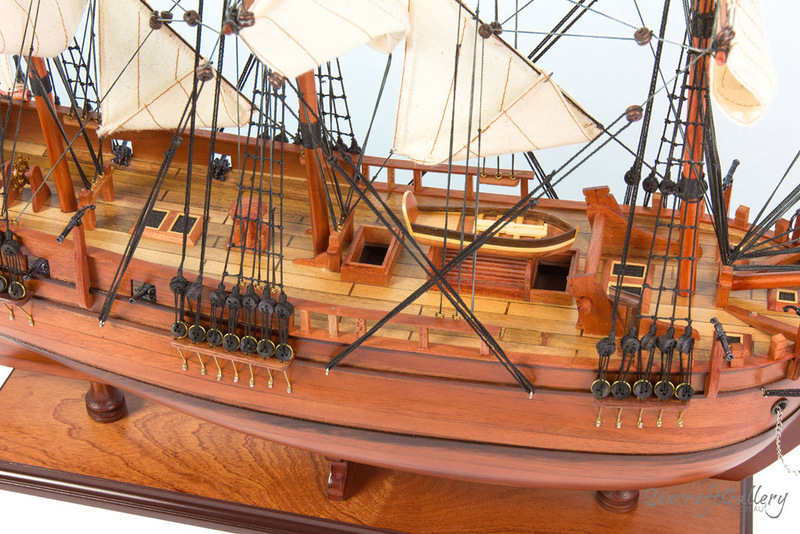 Deck features help to add attention to detail with realistic extras such as lifeboats and steering wheel are included. 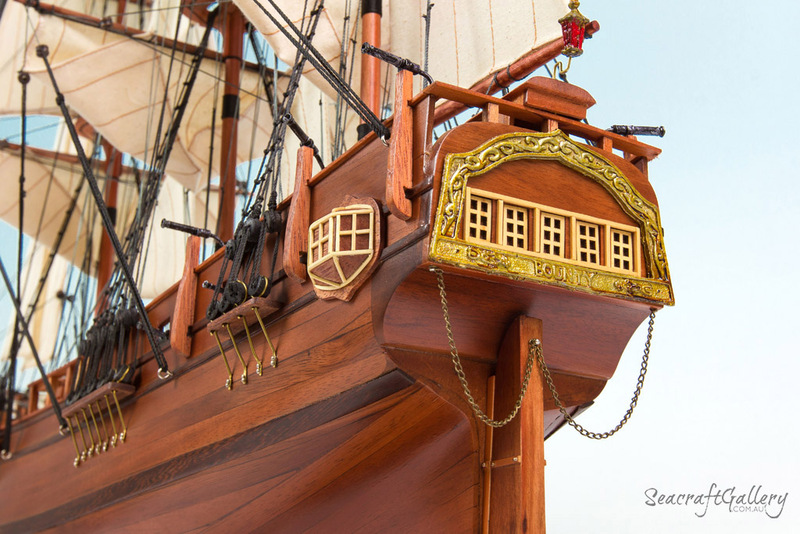 All sails are made using impressive fine linen and rigging lines of various formats. Solid and safe wooden base which comes with a metal name plate and a laminated fact sheet. 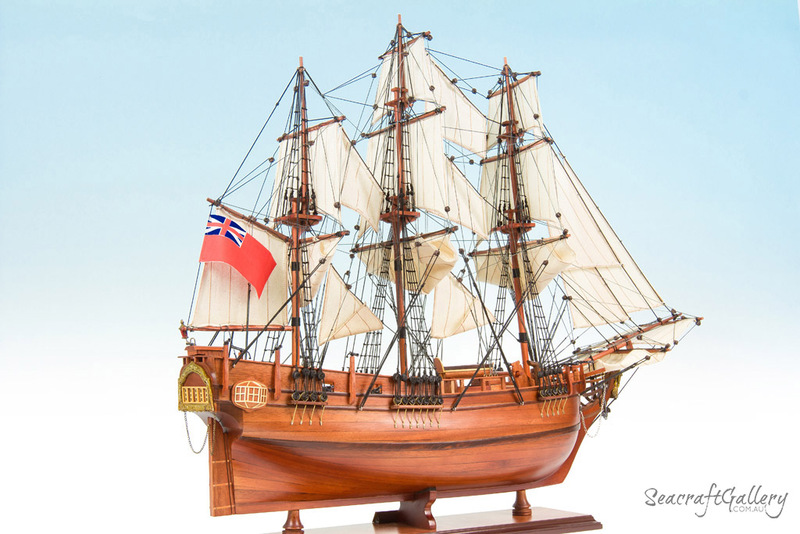 The HMS Bounty model ship is also available in 45cm. 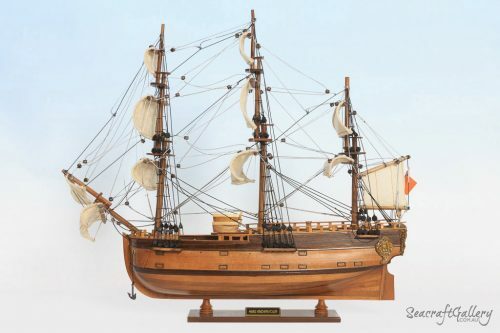 You may consider to purchase a display cabinet to protect the model ship from dust and damage. Once known as the Bethia, this collier was used for several smaller jobs prior to being bought out by the Royal Navy. 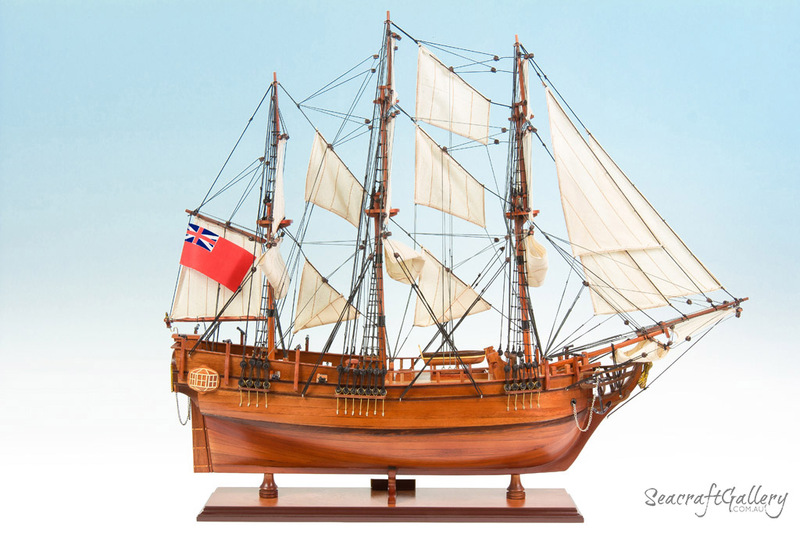 Bought thanks to its full-rigged status despite being quite small, it became an essential part of the 1787 breadfruit expedition. The idea came through the work of Sir Joseph Banks, who wanted to use breadfruit to grow cheap, simple food for the slaves of the era. putting William Blight in command of the ship, it was re-fitted for purpose and set off on its voyage. With 46 men on board under Bligh, it was seen as the perfect trip to take. 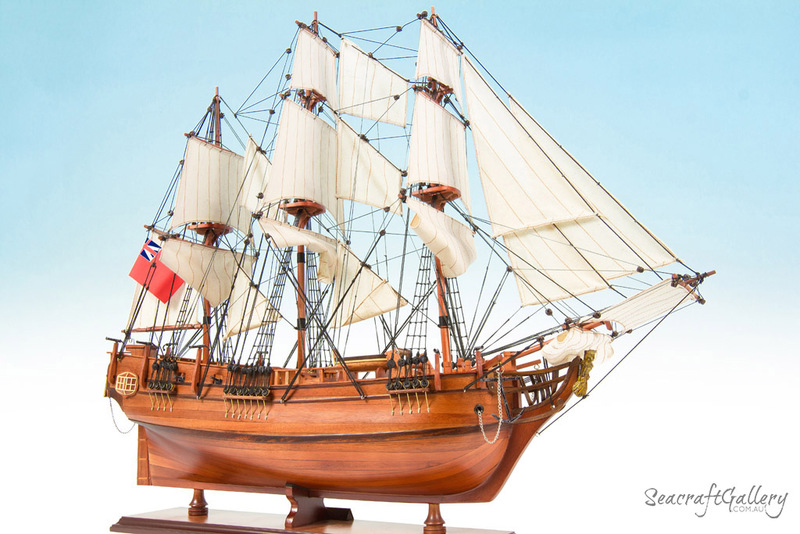 Few naval ships of the area are quite so recognisable and stand-out as that of the HMS Bounty. It was first put to sea for the expedition in 1787, leaving England in search of Tahiti in the South Pacific. On its journey, it was to pick up some breadfruit sapling and to take them over to the West Indies. It would serve as food for the many poor people trapped in enslavement. The Bounty finally arrived in late 1788, after a long journey, and stuck around for many months. Under the oppressive command of the infamous Bligh, though, the HMS Bounty was a ship that had endured multiple issues. Known as a notorious bully, Bligh was disliked by much of the people aboard his ship. Though some sources paint him in a slightly more lenient light, his appointment came due to his patronage of Sir Joseph Banks as well as his sailing experience alongside James Cook. Alongside his Master’s Mate, Fletcher Christian, there was much uncertainty throughout the crew. Indeed, Fletcher even married a local Tahitian, known as Maimiti. Five months were spent in Tahiti, when they were expected to sail off. The ship was eventually overtaken by a mutiny, with 22 men joining Christian whilst 18 remained loyal to Bligh. They were forced onto the ship’s boat and sent off to what would presumably be their deaths. However, Bligh and his men managed to survive, eventually arriving in Timor in summer 1789. There, he managed to get the breadfruit trees transported to the West Indies. The mutineers tried to land in Tubuai but were scared off by the locals. They returned to Tahiti, hoping that the Royal Navy would never return. The HMS Pandora eventually intervened, though, arriving in March 1791 and capturing the men. The Pandora kept them aboard until an August 1971 wreckage of the boat seen four of the mutineers die while the rest escaped. Eventually settling on Pitcairn Island, they removed all of the items from the HMS Bounty, and burnt it to the ground. They remained on Pitcairn Island until 1908, when they were found. Some, including Christian himself, were never found. The ship, though, left a very important legacy: the tiny island of Pitcairn Island. Today, the few inhabitants who live there can trace their own lineage back to Fletcher Christian and co.! Though it’s not known what happened in the end, the ship was likely stripped and destroyed, sadly. She is absolutely beautiful. I can highly recommend “The Bounty”. What a magnificently presented model. I am extremely pleased and satisfied with my purchase, its presentation and the fast delivery. Thank you.